In large bowl, beat eggs, egg yolk, granulated sugar, 1 1/2 cups milk, the whipping cream, vanilla and cinnamon with whisk. 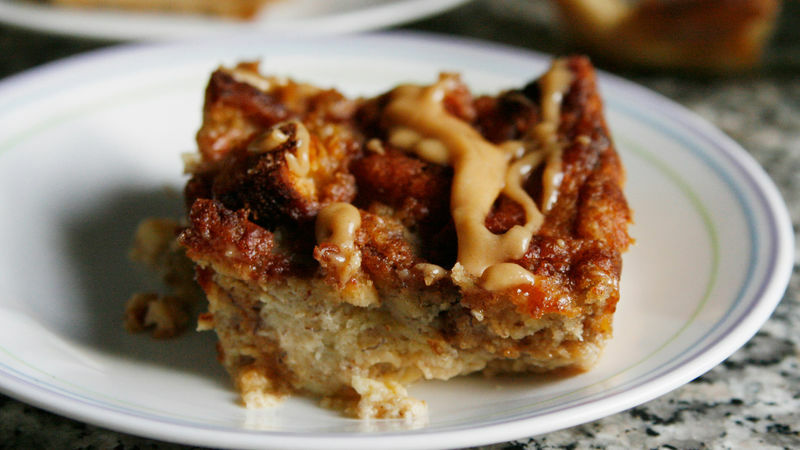 Stir in 3 cups of the banana bread cubes. Let stand 20 minutes. Heat oven to 325°F. Grease 8-inch square (2-quart) glass baking dish with shortening or cooking spray. Pour banana bread mixture into baking dish. Top with remaining 1 cup banana bread cubes; sprinkle with cinnamon-sugar. Bake 55 to 65 minutes or until puffed and golden (center will not be completely set). Cool 5 minutes. Meanwhile, in small bowl, mix peanut butter, 1 tablespoon milk and the powdered sugar. Drizzle over hot bread pudding. Serve immediately. You can substitute other nut butters for peanut butter, if desired. Greasing the pan is important! Otherwise the bread pudding will stick.